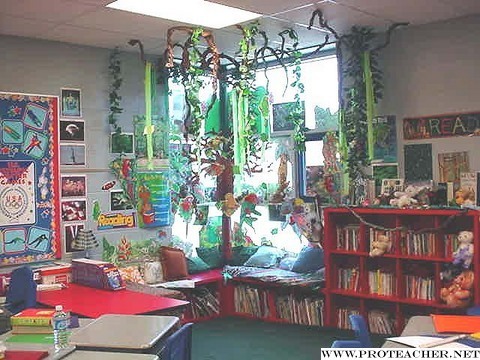 Our reading jungle starts with a bright green rug and goes all the way to the ceiling where branches and vines hang down to capture the essence of a tropical rain jungle. Hanging on the windows are posters, parrots, butterflies, tigers, and monkeys. The corner is completed with a comfy window pad and a ton of pillows. Various stuffed animals complete our corner which my kids love to hold and cuddle while they are reading in the "jungle". Our shelves are lined with all genre of literature, newspapers and magazines, and reference materials. Everyone who sees our jungle is memerized by it. I tell my children that "reading takes you anywhere" and I feel like I have provided a cool space to make reading more fun and inviting. It is a huge presence in our classroom and my kids especially love to turn out all the lights and read to the lamplight created by the seven lamps I have in my room. We love it!